These easy, delicious pumpkin spice muffins are a phenomenal treat to serve your family! Time with family, Messenger Kids — and some pumpkin muffins too — are a fabulous way to start any day! Growing up, there was a morning tradition that I loved: breakfast dates with my dad. Even though he started his day early, he always made time for us kids. Today, as a mama and aunt, I appreciate even more that my dad made such a point each morning to focus on us and start our day off right. It really helped set the tone for the day ahead! Since some of my favorite memories of growing up took place around the kitchen table, eating and talking with my dad during those early mornings, I’ve made sure to do the same with my own family. I love sharing my days with my family – we create so many special memories together and I’m so thankful we get to live life this way! However, some of my family lives across the country, so we can’t enjoy these times together with everyone we’d like to. I know a lot of families experience the same issue because they do not live in close proximity with one another. Thankfully, with technology these days, it can be much easier to stay connected and keep in touch. 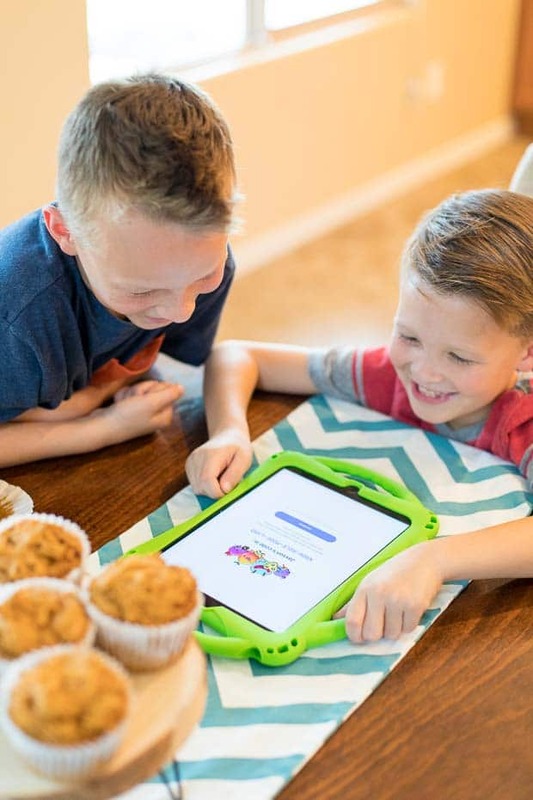 Messenger Kids lets my son and nephews talk to their relatives as if they lived next door. What I would have done for that opportunity growing up!!! Recently, my son and my nephews had a sleepover at our house. I had a special treat planned for the morning after their sleepover that I couldn’t wait to share with them: a breakfast date with grandpa. Just like I loved growing up! 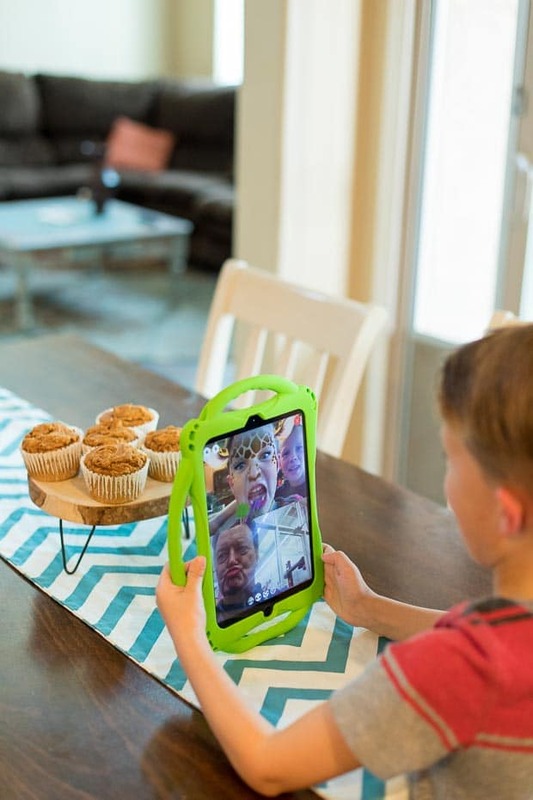 In the morning, I got the boys’ breakfast rolling, grabbed their iPad, and opened the Messenger Kids App — a free video calling and messaging app designed for kids to connect with close friends and family from their tablet or smartphone. 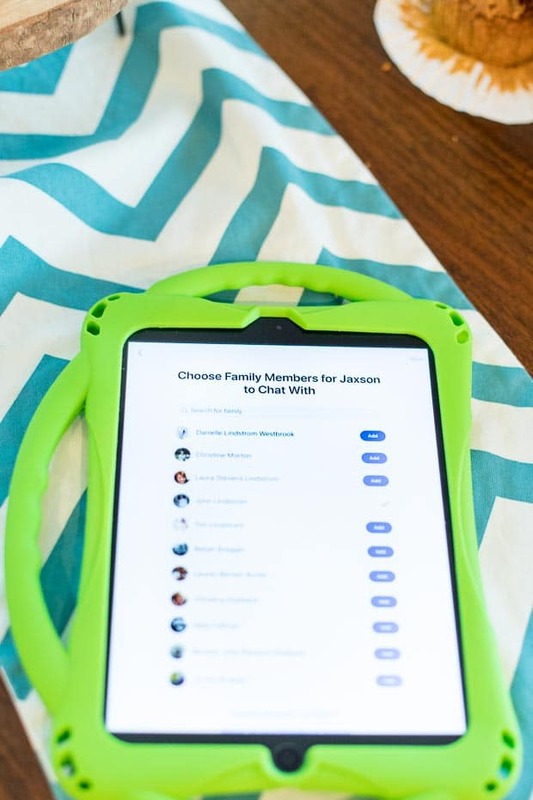 I love this app because parents control who kids can contact through their own Facebook Messenger, which gives me peace of mind because I know what my kids are doing is safe. 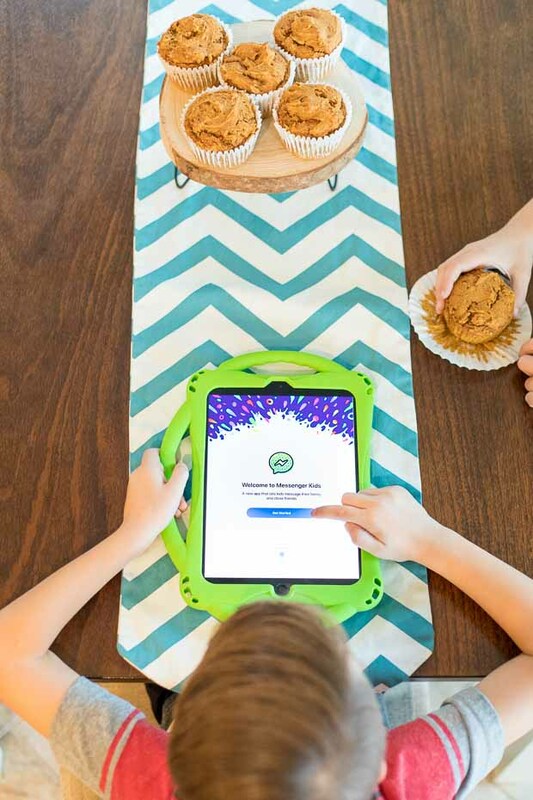 Here’s how it works: Once the app is downloaded to your kid’s device, you’ll authenticate the Messenger Kids account through your Facebook login. You name their account and you can then access the parental controls available in your Facebook account. I love how easy it is! I also love that you can do group or one-on-one video calls. You can make it even more fun with interactive masks, reactions and sound effects available within the app — which the boys L-O-V-E. The app is free and can be downloaded from any of the app stores: Apple, Android or Amazon Fire. 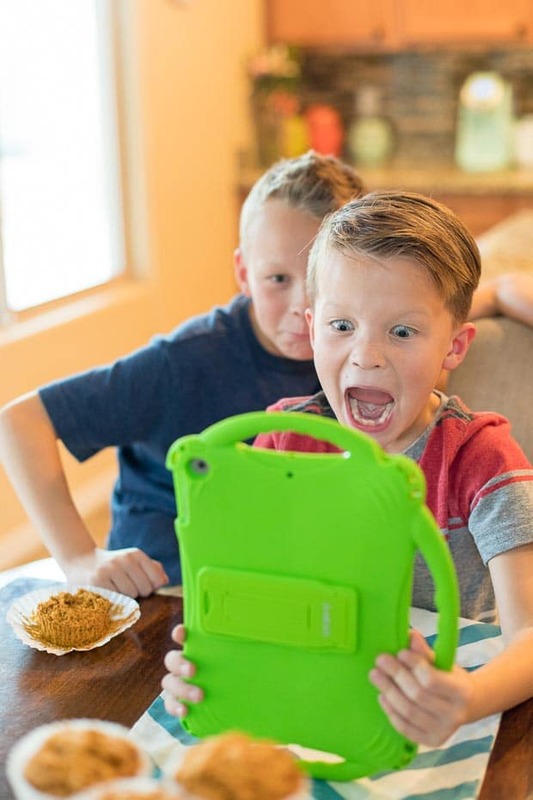 At all times, you’ll have complete control over your kiddo’s contacts and experience. It even has a sleep mode, to help monitor their screen time access. I usually put it on sleep during dinner and homework time so there are no distractions. Another great safety feature: messages don’t disappear and can’t be hidden so parents have full access at all times. I love all the features they’ve included in the app to make this a great experience for the whole family! My nephews were settled in at the table with their pumpkin muffins. After setting up the Messenger Kids app, they were ready to chat with grandpa. All those special memories of sitting with my dad at the table came flooding back to me as I watched them giggle and interact with my precious dad. The boys told dad what was coming up in their days and then wasted no time in creating silly faces with help from the frames and stickers. Some days, the boys are quick with the words and know exactly what they want to share. Other days, they need a little nudge or question to get the conversation started or all you get are one-word answers. When that’s the case, our family refers to this free printable cheat sheet. 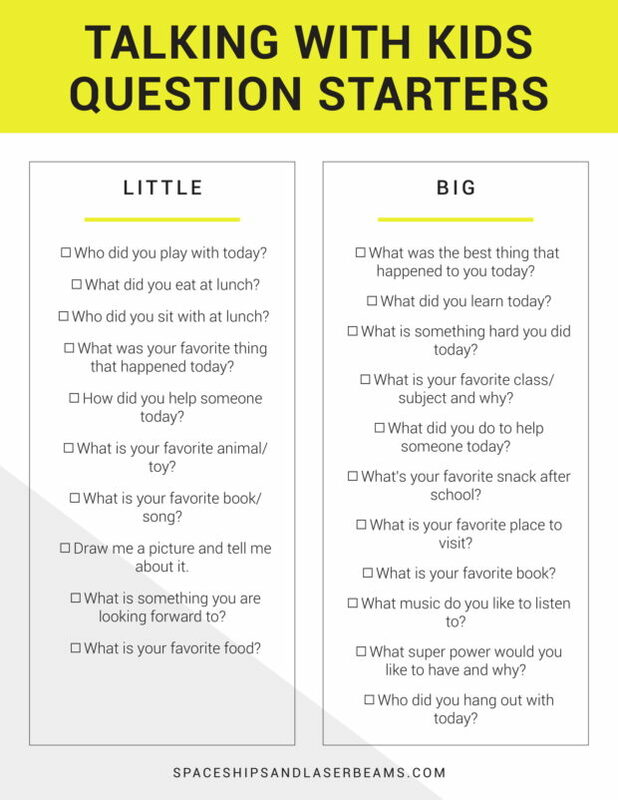 It’s got a great mix of questions for both big and little kids to help get a meaningful conversation started. We sent copies to family members so, if the boys are being quiet, you can select a question to ask and get the ball rolling. Now, let me tell you about the simple, moist pumpkin muffin recipe I promised you earlier. You won’t believe how easy it is! This pumpkin muffins recipe is a staple at my house — we all think it’s the best. I often make a big batch to have on hand for breakfast or snacks, especially during the fall when I crave all things pumpkin. One of the best parts? There are only two ingredients. Mhmm. Like I mentioned above, I love when things are easy. That said, you can add in other treats if you want. I’ve added chocolate chips, a little cream cheese, oatmeal, zucchini, or even apple. My nephews loved munching on these pumpkin muffins while chatting with their grandpa. And the kitchen smelled incredible! I’m sure that as the boys grow up, they will fondly remember breakfast chats just like I do. All made possible thanks to great technology like Messenger Kids! Using a 1/2 cup measuring cup, portion the pumpkin spice muffin batter into a pre-lined jumbo muffin pan. Bake for 18-25 minutes (depending on how big your muffins are) until an inserted toothpick comes out clean. Cool on a cooling rack, and then enjoy! This is a great bonding, making muffins with my kid! The kids loved these for a go to snack!